Terreplex is a carbon-rich acidifier derived from the lignin in trees. It is a natural organic polymer, fully biodegradable, non-phytotoxic, non-corrosive, and economical for use on turf. It reduces bicarbonate levels, helping convert bound minerals into plant-available forms while acting as a complexing agent to improve absorption. Terreplex contains over 3 lbs of carbon per gallon – more than any other leading product – providing the energy source needed to stimulate soil microbial activity. Users can expect to see enhanced turf nutritional program efficiency, increased cation exchange capacity, and improved soil structure. Bicarbonates, and other anions like carbonates, found in many sources of irrigation water can affect soil properties by increasing their salinity and affecting the ratios of exchangeable sodium, calcium, and magnesium. Terreplex can counteract the bicarbonates by injecting into irrigation systems to neutralize the water, or by spray applications directly to the soil. The by-products of the breakdown of the lignosulfonate/lignosulfonic acid in Terreplex are carbohydrates, sugars and other carbon-containing compounds. These compounds provide a food source for beneficial microbes living in the soil. Research indicates the numbers of soil microorganisms can increase two- to eight-fold within weeks of lignosulfonate/lignosulfonic acid application. Stimulating soil microbes to greater activity has shown to help breakdown organic matter, aid in conversion of fertilizer to available forms, improve soil structure, and reduce the severity of disease caused by soil-borne pathogens. Turf managers can maintain a more neutral soil pH by applying Terreplex directly to the soil or by injecting Terreplex into irrigation water. Research indicates that soil pH is reduced following applications of lignosulfonate/lignosulfonic acid. Decreasing soil pH unlocks many plant nutrients like calcium from insoluble, non-plant available forms, making them available to plants. However, it is not enough just to unlock plant nutrients as some forms are more plant available than others and some leach more readily than others. Terreplex converts plant nutrients like Ca and Mg to organic, lignosulfonate forms that remain plant available with minimal leaching. The lignosulfonate compounds in Terreplex are natural chelating agents that have the potential to increase the availability of micronutrients. As Terreplex provides over 3 lbs of carbon per gallon, it is a rich source of carbon for stimulating microbial activity in the soil. It therefore has the potential to replace other carbon-rich stimulant products in a turf management program, resulting in cost savings. Applying acid directly to soil or acidifying irrigation water accelerates the dissolution of minerals containing calcium, magnesium, iron and potassium. As these minerals dissolve, they release ions into the soil that promote clay flocculation, improve soil permeability and increase fertility. Improved flocculation and permeability aids in air and water movement in the soil. Terreplex can be safely applied by spraying directly on turf, and is not classified by DOT as a hazardous material. It does not require special storage or handling for injection or spray applications. Terreplex can be used as a descalent to clean deposits from irrigation lines. Normal use rates and intervals can prevent deposition. Higher rates may be required to clean out previously clogged lines. Terreplex is a carbon rich, acidic mixture of lignosulfonic acids derived from the natural polymer, lignin, a renewable, natural resource. What is Terreplex used for? Terreplex can be used to reduce bicarbonates and/or unwanted salts that may negatively impact turf quality, improve soil pH, stimulate soil microbes, convert locked nutrients into forms that are more available to plants, open soil pores and improve flocculation. How does Terreplex compare to other sprayable acid products? The lignosulfonic acid in Terreplex reacts in the soil to form calcium lignosulfonate, a highly soluble, plant-available source of calcium with minimal leaching. Compare this to other acids that react in the soil to form chloride-containing salts (e.g., calcium chloride) or low-solubility compounds that are not readily available to plants (e.g., calcium phosphate). Lignosulfonate compounds are natural chelating agents that have the potential to increase the availability of micronutrients. Unlike synthetic and other acid products, Terreplex is derived from lignin, the second most abundant organic polymer on earth, and delivers over three pounds of carbon per gallon. As a significant source of carbon, Terreplex has the potential to replace other carbon-rich stimulant products in a turf management program, resulting in a cost savings to the superintendent. What is the importance of the carbon content of Terreplex? A major fraction of the material that becomes soil humus naturally is contributed by the decomposition of lignin. Similarly, the by-products from the breakdown of Terreplex (carbohydrates, sugars and other carbon-containing compounds) provide a food source for beneficial soil microbes contributing to overall soil productivity. Research indicates the numbers of soil microorganisms can increase within weeks of lignosulfonate/lignosulfonic acid application. Stimulating soil microbes to greater activity has many beneficial effects including conversion of fertilizer to available forms, improvement of soil structure, and the potential to significantly reduce the severity of disease caused by soil-borne pathogens. Are there any additional impacts I can expect to see with regular use of Terreplex? How do I determine the use rate? The label contains guideline rates that will work for most applications. (To determine optimum rates for an individual site, a water and/or soil test should be done. 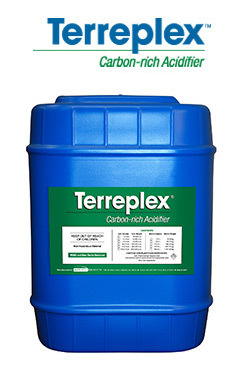 A Terreplex application program typically begins with an initial shock treatment (64 oz/A) to address accumulated bicarbonates, etc., in the soil followed by a maintenance program of 32-64 oz/A at 14-day intervals. Once I determine my use rate, will it stay the same throughout the season and from year to year? A number of factors can influence the severity of the problem, and thus use rate, including the amount of rainfall, irrigation frequency and soil type; e.g., a ‘mini’ drought during the growing season may require higher rates for a period of time. Severity can also vary from year to year requiring rate adjustments from season to season. Once I treat with Terreplex and ‘cure’ the problem, is it necessary to continue treatment? Typically, when a turf manager has a problem with high salts, bicarbonates, etc., it is due to environmental conditions like irrigation water quality, soil type, amount of natural rainfall, etc. These conditions persist after any Terreplex applications are discontinued, returning the site to its former condition over time. Therefore, acidification is an ongoing commitment and not a situation that can be treated and forgotten. Do I need any special equipment to apply Terreplex? Unlike sulfuric acid which is classified by DOT as a hazardous material requiring special storage and handling, Terreplex can be safely handled and stored and requires no special equipment for injection or spray application. Can I tank mix Terreplex? As is the case with any acid, do not tank mix Terreplex with any products of an alkaline nature or any that are sensitive to a low pH environment. Tank mixing acid with alkaline solutions can reduce some of the acidification properties, leaving little or no activity to react with bicarbonates, etc., in the soil. Tank mixing acid with products like pesticides that are sensitive to low pH can reduce their efficacy. For maximum efficacy, we recommend that Terreplex be applied alone. If tank mixing is necessary (avoid alkaline materials or those sensitive to low pH environments and do a jar test), apply tank contents immediately. Do not let them stand. Can I apply Terreplex through my irrigation system? Yes, Terreplex is labeled for use in irrigation systems. Contact your local Terreplex representative or Mitchell Products with any specific questions.